Renault's Clio bonnet defence | What Car? Renault has denied there is any link between the low uptake of its offer to perform safety checks on Clio Mk2 and Clio Campus bonnet catches and a poll suggesting the majority of owners have not received the letter warning them of the potentially dangerous problem. 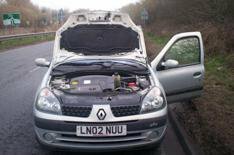 Last year, Renault wrote to more than half a million owners of the affected cars, saying that their bonnet catch could fail if it is improperly maintained. However, last week the Vehicle and Operator Services Agency (VOSA) revealed that only 28% of affected car owners had taken their car in for a check-up. This comes after a poll on a website set-up by affected car owners which suggested 78% of owners had not received the letter from Renault offering them a free safety check on their cars. Renault is now preparing to send a second warning letter to the 565,000 affected car owners by registered post, but it denies that this has anything to do with the low uptake of its initial offer, or because of the survey's findings suggesting that a majority of owners didn't receive the original letter. A Renault spokesman said: 'The two matters are completely unrelated. One refers to the claimed volumes of vehicles which have visited a dealership, the other relates to a claim about how many owners received the letter, two completely different factors. 'If a person chose not to act upon the advice in the letter, as sometimes happens in vehicle safety recalls, this does not mean they did not receive the letter. The spokesman was unable to confirm when the second warning letter would be sent, beyond saying that plans to send it out were 'progressing'. Suggestions from VOSA's Head of Vehicle Safety Branch, Jeff Streeting, that it may require a third warning letter to alert affected car owners were also dismissed. 'Such a question is not relevant when the second mailing is in process,' said the Renault spokesman.